The flexible Brexit extension until Halloween given to the UK by EU leaders prompts a spirited response from Europe's papers.But it's what the wrangling in Brussels means for EU unity ahead of European Parliament elections next month that preoccupies many in the media.For France's Le Monde, it's a "Halloween Brexit... due on 31 October, the Anglo-Saxon holiday of pumpkins and witches".It says President Emmanuel Macron backed Prime Minister Theresa May's request for a short delay until 30 June but "was forced to compromise". The leaders finally split the difference with a typically European compromise: "they cut the pumpkin in half". France's Liberation believes the extension came at the cost of breaking the united front of EU leaders. "This increasingly incomprehensible waltz of dates shows that the UK has succeeded in exporting its byzantine internal battles to Brussels. For this summit broke to pieces the nice, united European front which held together, for better or for worse, for three years." Trick or treat"Which is to say, they are giving London a capacity for nuisance which it could not have dared dream of." Germany's Die Welt agrees the effect of Brexit is that "the alliance of the 27 member states is crumbling". "The diverging 'Brexit philosophy' in Paris and Berlin is obvious. With his hard line towards London, Macron wants to scare populists in his own country about similar anti-EU plans. Berlin, on the other hand, sees long-term damage in a lacking willingness to compromise, which could truly bring the populists onto the scene." In the Netherlands, Algemeen Dagblad says Europe is in a very difficult position. "Everybody agrees that a no-deal Brexit is undesirable for all parties… The EU, facing the prospect of European parliamentary elections in May, does not want to be perceived as the bad guy dropping the UK into misery." Other papers take a very tough tone towards Britain. 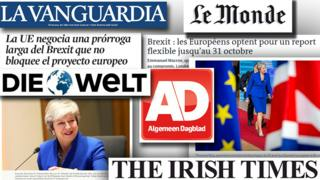 Barcelona-based La Vanguardia says: "The extension discussed through an intense debate at an informal summit in Brussels is the second one and should be final. The British decided to leave the EU by their own volition," in a post-summit editorial headlined "Brexit and the patience of the EU". In Italy, there's recognition of the EU's tough choices. For Il Sole 24 Ore, "the 27 want to rule out a dramatic, hard Brexit, but they also want to avoid Britain's permanence in the Union, one foot in and the other out, impacting on European affairs". An alternative take that cannot be allowed to slip through the net comes from Patrick Smyth in the Irish Times who warns of the very real threat of a no-eel Brexit.He's talking about the transhipment of live species - in this case eels from Lough Erne in Northern Ireland - to the Republic, and the broader point of importing animal-based food products into the EU. "It is true that the fate of the eels can be said to be small beer compared with the impact on the Irish economy of a no-deal Brexit. But it is an illustration of the breadth of the potential impact." While the likelihood of a no-deal Brexit may have receded, he says, "we may well be back all too shortly facing up for real to a dreadful prospect in which, among other issues of greater import, the fate of eels and ham sandwiches will again be on the order of the day. "BBC Monitoring reports and analyses news from TV, radio, web and print media around the world. You can follow BBC Monitoring on Twitter and Facebook.